In the past, I have recommended FTDI based USB-RS232 adapters strongly because of their reliability and compatibility, albeit at a price. Prolific manufactures a competitive solution, and some time back they poisoned their Windows driver to disable access to counterfeit chips. A bad move, the only answer is to not buy ANYTHING with Prolific chips, because even if they work now, they might not tomorrow when you most need them to work. The end user does not have the means of validating the authenticity of chips inside devices that they may buy, they do depend to a very large extent on the seller’s representations. It was inevitable that someone would successfully clone FTDI chips as they were quite expensive and the incentive to clone was provided by FTDI’s pricing policy. 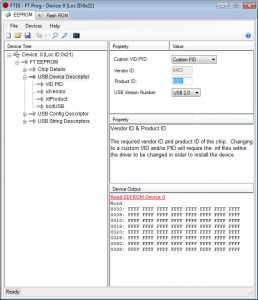 FTDI’s answer has been to poison their driver which might be applied automatically from Windows update. archive a copy of the drivers before they were poisoned so that you can reinstall them if inadvertently updated (which could happen due to Windows Update or a product installation that brings FTDI drivers). 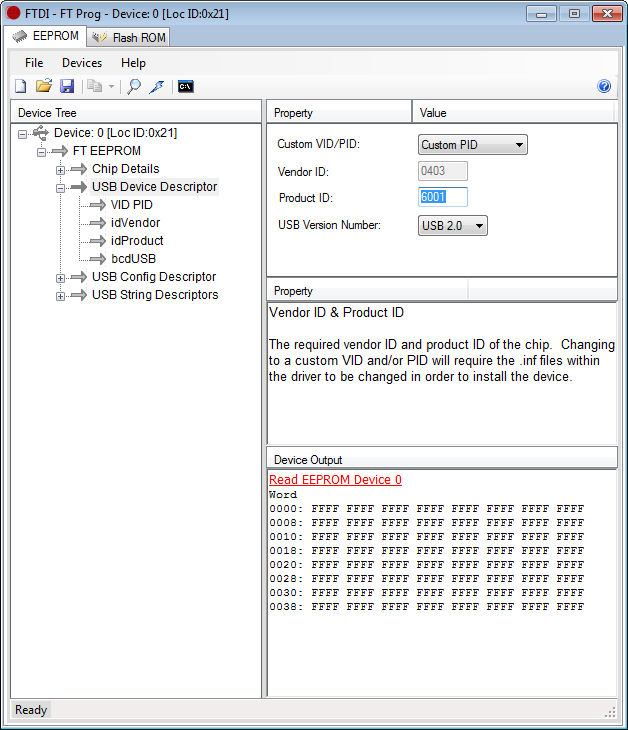 Now the particularly devious action of FTDI is that they use the poisoned driver to change the ProductId on the adapter so it will not be recognised, even with back level drivers or on a different computer… they have ‘bricked’ the adapter to prevent the owner being able to use it. The ProductId can be changed back using FTDI’s FT_PROG utility, but fix the poisoned driver issue first so that it doesn’t get bricked again. FT_PROG is real techo stuff… and you never needed to know about it until FTDI decided that as the purchaser of equipment with an embedded counterfeit FTDI chip, you were a cyber criminal and with Microsoft’s Windows Update assistance they would silently brick your entire device. For most purposes, we would be well served by an ACM compliant serial adapter… especially if Microsoft fixed AMC support in Windows. The application need is basic and extensive, support for USB-RS232 should be based on generic hardware and open architecture drivers… and then we would not need Prolific for FTDI. This is one of those case where Prolific had damaged its prospects and FTDI have been eager to follow suit… “snatching defeat from the jaws of victory comes to mind”.